32% said they plan to spend less on holiday shopping this year. 13% said they plan to spend more; 46% said expenditures will stay the same. Saving money, not spending it, is on many customers’ minds as they shop for the holidays, according to new Morning Consult data — another potential crack in an economy that should be booming amid low unemployment and rising wages. The period between Black Friday and Christmas Day is by far the busiest time of the year for the retail industry, a critical segment of the economy that accounts for only about 5.6 percent of the United States’ gross domestic product but is the largest private-sector employer in the country, according to the National Retail Federation. “This is retail’s Super Bowl,” said Ryan Sweet, director of real-time economics at Moody’s Analytics. The shopping season can also serve as a barometer of wider trends in consumer spending, which makes up roughly 70 percent of GDP. Customers take stock of their own finances while shopping during the holidays, tallying how much they can afford to spend on gifts and other holiday expenses. And with the unemployment rate at 3.7 percent, the lowest level since 1969, and the Labor Department’s Employment Cost Index showing civilian wages rose 2.9 percent in September from the year-earlier period, economists have much reason to believe that it should be a blowout holiday shopping season. But Morning Consult data suggests that holiday spending could underperform those high expectations. Nearly a third — 32 percent — of U.S. adults said they plan to spend less this holiday shopping season, according to a recent Morning Consult poll. Far fewer, 13 percent, said they are planning to spend more this year. A plurality of 46 percent said they will spend about the same this year, according to the survey, which polled 2,201 adults from Nov. 1-3. 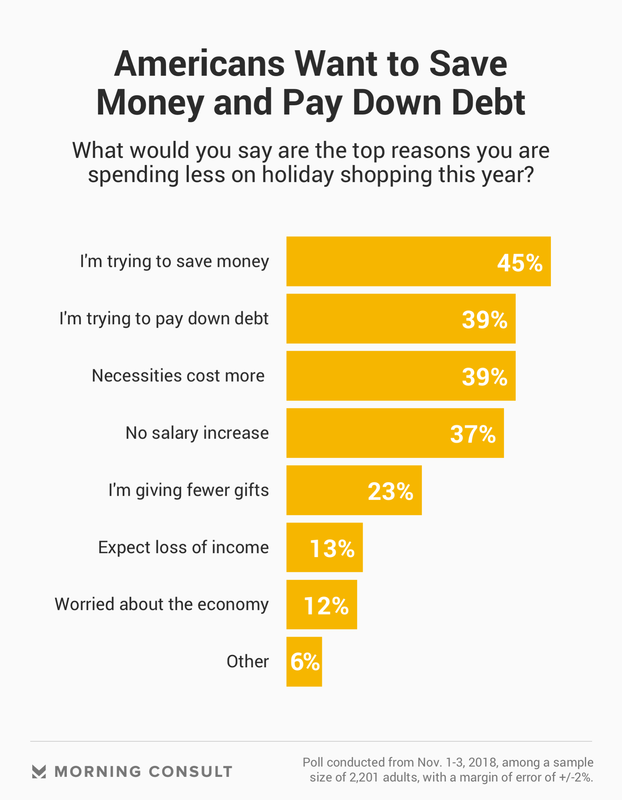 Of those who said they will spend less this year on holiday shopping, 45 percent said they are trying to save money, and 39 percent each said that they are trying to pay down debt and that the price of necessities like food, rent and clothing has increased. “So consumer spending could be softer than wages and unemployment would suggest in the near term,” Panday said. A National Retail Federation survey released Nov. 27 estimated that 165 million Americans shopped in stores or online from Thanksgiving Day through Cyber Monday. That’s down from 174 million in the same period last year. 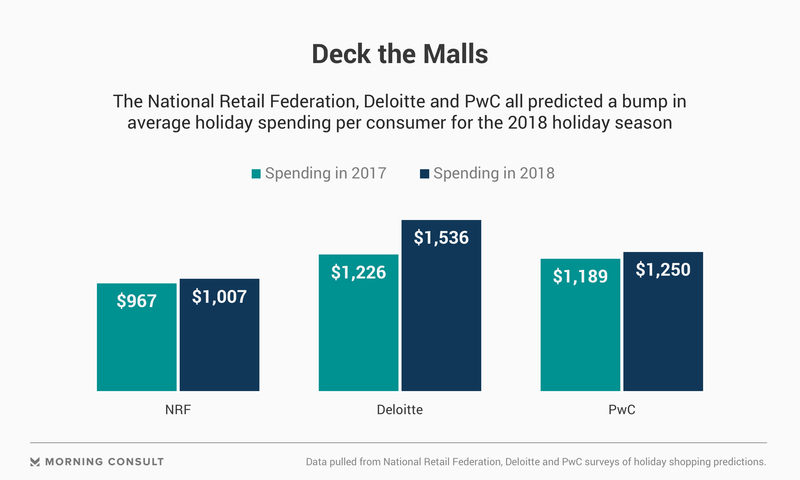 Average spending per person declined as well over the weekend, to $313.29 on gifts and other holiday items, a drop from $335.47 in the year-ago period, according to the NRF. Still, retailers are expecting to eventually see a sales bump from last year. The NRF called Black Friday weekend a “strong emotional start,” and a “positive indicator” for the rest of holiday shopping. The NRF, Deloitte and PwC have predicted a rise in holiday sales this year, citing a healthy consumer and strong underlying economy. While Morning Consult’s poll asked consumers if they plan to spend more, less or the same as last year, it did not gauge how much more or less they plan to spend. Although wages and unemployment remain strong, other economic indicators are showing signs of wavering. The stock market saw a rout in November that pushed the S&P 500 briefly into correction territory. And consumer confidence dipped from an 18-year high during the month as optimism about future economic conditions slipped, according to data released by the Conference Board on Nov. 27. Consumer confidence remains, however, at “historically strong levels,” Lynn Franco, Senior Director of Economic Indicators at The Conference Board, said in a statement. Claire is a reporter at Morning Consult covering financial regulation.